Turvey Trails - 4 mile walk at Turvey Walking RouteThis nature walk is 6km or 4 miles, taking in the beautiful countryside around the historic village of Turvey. There are chances to see birds such as skylarks, buzzards and hobbies, as well as butterflies such as the Purple Hairstreak. There are magnificent views across the countryside to the south west. 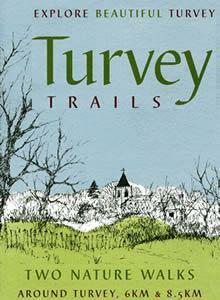 This nature walk is 6km or 4 miles, taking in the beautiful countryside around the historic village of Turvey. There are chances to see birds such as skylarks, buzzards and hobbies, as well as butterflies such as the Purple Hairstreak. There are magnificent views across the countryside to the south west. How to get there by car/parking: Turvey is on the A428, 8 miles west of Bedford. There is street parking off the High Street in Turvey.